Soldiers are reported to have taken over the headquarters of Zimbabwe’s national broadcaster, ZBC, amid a growing political crisis. Explosions have also been reported in the capital, Harare, but the cause is unclear. Earlier, the country’s ambassador in South Africa denied talk of a coup. Zimbabwe’s ruling party accused the country’s army chief of “treasonable conduct” after he warned of a possible military intervention in politics. General Constantino Chiwenga had challenged President Robert Mugabe after he sacked the vice-president. Gen Chiwenga said the army was prepared to act to end purges within Mr Mugabe’s Zanu-PF party. 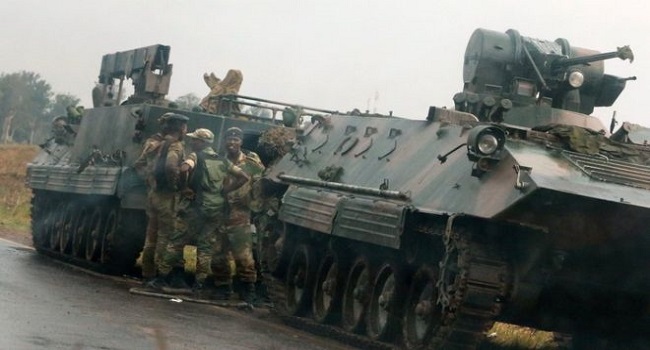 Tensions were raised further on Tuesday when armoured vehicles were seen taking up positions on roads outside Harare, although their purpose was unclear. Some staff at ZBC were manhandled when soldiers took over their offices in Harare, sources told Reuters. Workers were told that they “should not worry”, a source added, and that soldiers were only there to protect the site. The Zimbabwean ambassador to South Africa, Isaac Moyo, had told Reuters that the government was “intact” and dismissed any talk of a possible coup as “just social media claims”.